Fine wine, abundant electricity, wild salmon -- the things Oregonians take for granted. But keeping them will be harder than ever because we plan and build our lives in the belief that Northwest weather will always be Northwest weather. It's not so, researchers are finding. We should expect hotter, drier heat waves, heavier rains and quicker snowmelt. The Northwest, a natural target of major storms, will feel it in ways other regions will not. It particularly challenges public agencies and private businesses, which now must expect climate curveballs, such as the record-setting November deluge -- Portland's wettest month since 1938, Seattle's wettest in 115 years. Warmer summers already have altered the taste of Oregon's signature pinot noir wines, and vintners are shifting their vines uphill to keep them cool. But that will not be enough. By the end of the century, the iconic grape of the state's $1 billion wine industry will grow better along Washington's Puget Sound than it does in the Willamette Valley. Volcanic debris once locked in place by Mount Hood's ice, now exposed by melting glaciers, ripped away miles of Oregon 35 during the November storm. Crews hurriedly pieced it back together at a cost of $10 million, just in time for ski season, but only a far more costly fix will fortify the road against escalating floods bearing yet more boulders. "We have to ask, 'Do we want to spend hundreds of millions rebuilding things the way they are?' " says Gail Achterman, a member of the state highway commission and director of the Institute for Natural Resources at Oregon State University. "These events are not going to stop happening, and every climate model suggests they're going to happen more often." It's impossible to blame a single storm on global warming. But research shows the November blast was a preview of events we will see more often: heavier rain earlier in the winter; rain falling in place of snow, even in the mountains; all that extra rain rushing downstream in floods. The trouble, scientists say, is that society does not view climate as something that substantially shifts. "Our vulnerability to climate is based on the expectation that climate is predictable," says Nathan Mantua, a research scientist at the University of Washington's Climate Impacts Group. "We in our minds are driving on cruise control thinking the road's going to stay straight. We don't realize it can change drastically." Instruments track nearly every snowflake and raindrop falling across the West, all so federal forecasters can tell us how much water will flow to our farm fields and faucets each year. But their forecasts, vital to the region's farmers and water managers, are drifting off the mark. "In the early '80s, the skill really began to drop off," says Tom Pagano, a water supply forecaster with the U.S. Natural Resources Conservation Service in Portland who documented the trend. The climate's to blame. In a way forecasters had never seen, it's veering wildly between wet and dry and cool and hot. Weather is so complex it's impossible to identify warming as the cause. But the swings complicate life in a region already changing as it warms. 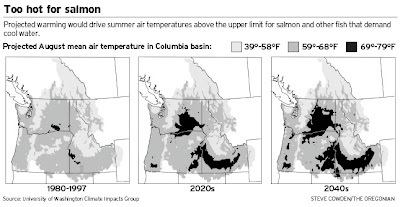 Rising temperatures are a certainty for the Northwest and already have begun to shift snow and runoff patterns vital to salmon migration and hydroelectric power. It is less clear how mounting greenhouse gases will affect rainfall and other weather patterns. But climate projections show higher temperatures intensifying droughts and storms in the Northwest -- a kind of climatic bull's-eye. Here's how: Evaporation off a warmer ocean injects more water into the air, which absorbs ever more water as it warms. That fuels stronger storms that carry bigger buckets of rain and snow onto land, according to studies by the National Center for Atmospheric Research in Boulder, Colo.
Average annual precipitation has risen across much of the region since 1920, University of Washington studies show. The storms are expected to collide more directly with the Cascade Range, which may wring yet more moisture from the clouds, says Eric Salathe, a Climate Impacts Group research scientist. Already, he says, winter storms arrive earlier. December once was the rainiest month in much of the Northwest, now it's November, data show. Last month, almost 50 inches fell in Oregon's Coast Range west of Salem, beating a December 1996 record that was thought to be unbreakable. Even without wetter storms, the Northwest still will see more rain. That's because the predicted warming of one quarter to 1 degree per decade this century will turn much of the Northwest's snow to rain. Snow accumulation in the mountains at the end of each winter has declined about 25 percent since about 1920, according to Phil Mote, Washington state's official climatologist. It'll get worse: By the 2090s, the Northwest's mountain snows will melt almost three months sooner than they do now, UW projections show. Problem: As more rain falls, the same rivers and streams are left to drain an overwhelming amount of runoff. The west side of the Cascades, where a slight rise in winter temperatures will turn a lot of snow to rain, is especially vulnerable, says Alan Hamlet, a UW research scientist. "That's the area we should really worry about, where risks have already gone up and where they will probably continue to go up," he says. Complicating the picture is that shrinking snows expose more ground, which absorbs heat and warms the air more, according to studies by Purdue University's Climate Change Research Center. The unlikely flip side of this waterlogged scenario is an increasingly parched summer. That's because rainwater vanishes quickly compared with snowmelt, which will be in shorter supply. Hotter days will only accelerate the drying. Already, 10 percent of the Columbia River's flow at Bonneville Dam has shifted from spring and summer months to fall and winter months since 1929, says Kyle Dittmer, a hydrologist and meteorologist with the Columbia Intertribal Fish Commission. That leaves less water in hotter months, when it's needed to cool streams for salmon and to spin turbines for electricity. The number of extremely hot days in the Northwest will double by the end of this century, the Purdue studies found. The trend has already appeared: Examination of temperature records from 1960 to 1996 by the Northeast Regional Climate Center at Cornell University showed increases in extremely hot days across the Northwest. That's a challenge if you grow a certain grape for a certain kind of wine. Oregon vineyards made their reputation with pinot noir, sensitive to heat. The weather must match the grape's preferences precisely for an award-winning wine to emerge. "The cool climate is what we've hung our hat on here," says Harry Peterson-Nedry, founder and managing partner of Chehalem, a leading winery based in Newberg. But growing seasons have turned warmer in only the 30 or so years since Oregon wines took off. So far that has been good, producing superior vintages grown in the ideal window of temperatures for pinot noir. "We have moved to the middle of the window," Peterson-Nedry says. "But the problem is, we're not going to stop there. If we could stop it there, we would." 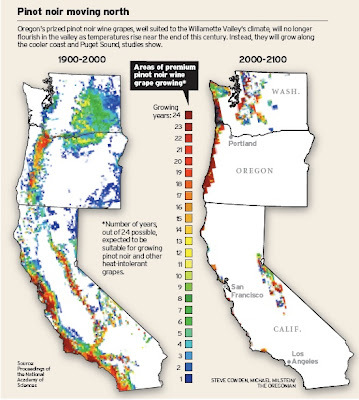 When researchers plotted places that will remain cool enough for Oregon's iconic grape by the end of this century, they were left mainly with a narrow strip along the coast and land to the north around Puget Sound. 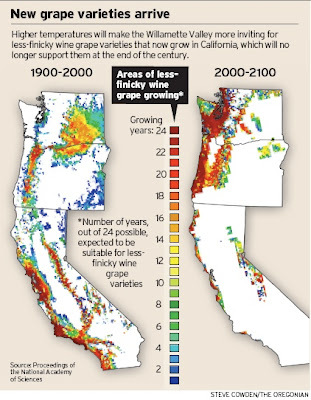 The shift may present other opportunities, however: The Willamette Valley could become more hospitable to grapes California is known for today. Some wineries already are experimenting with warmer-weather grapes such as syrah, staple of France's hot Rhone Valley and abundant in California. "That's with the anticipation they're going to be planting and harvesting those varieties here someday," Peterson-Nedry says. On the east slope of Mount Hood, highway engineers expect more destructive floods to tear into Oregon 35. It's happened five times in the past eight years. Glaciers are melting faster, exposing even more unstable debris to future, wetter storms. The same thing happened at Mount Rainier National Park, shut down by the record November rains. Geologists say the retreating glaciers have released so much extra sediment into river channels that streams flow dangerously high -- dooming roads tourists have driven for nearly a century. Crews on Mount Hood installed larger culverts to shunt more water under Oregon 35 in a furious push to reopen the road, vital to the ski industry. But the Oregon Department of Transportation admits they will not withstand another deluge. The agency lacks the money for a bigger fix, which could involve larger bridges over the unpredictable White River and cost more than $70 million. The state hopes to persuade federal authorities to foot the bill, arguing that such a big price tag will save money in the long run by avoiding repeated repairs. The rule of thumb for the Federal Highway Administration is to balance those costs over the next 20 years, says David Cox, division administrator for Oregon. "We look at a much shorter horizon than you would think," he says. But the implications of global warming do not end in 20 years. By then, the climate may be changing even faster and in more unexpected ways, researchers say. Although scientists are a conservative bunch, some worry we have underestimated how sensitive the climate is. Change feeds on itself. This month, new findings showed the Arctic may lose its summer ice by 2040. That exposes more water, which absorbs more sunlight, which warms an ocean already heating rapidly. "Things are happening now almost faster than we can predict them," says Richard Gammon, a UW chemistry and oceanography professor. "Right now, the scientists are more alarmed than the general public."